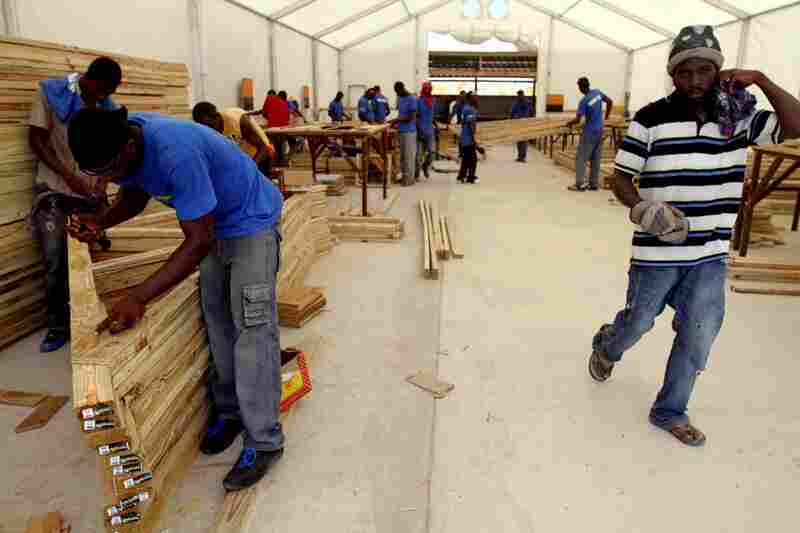 Amid Slow Recovery, Haiti's Tent Cities Remain The task of getting Haitians displaced by January's devastating earthquake out of tents into temporary shelters is going far more slowly than planned. 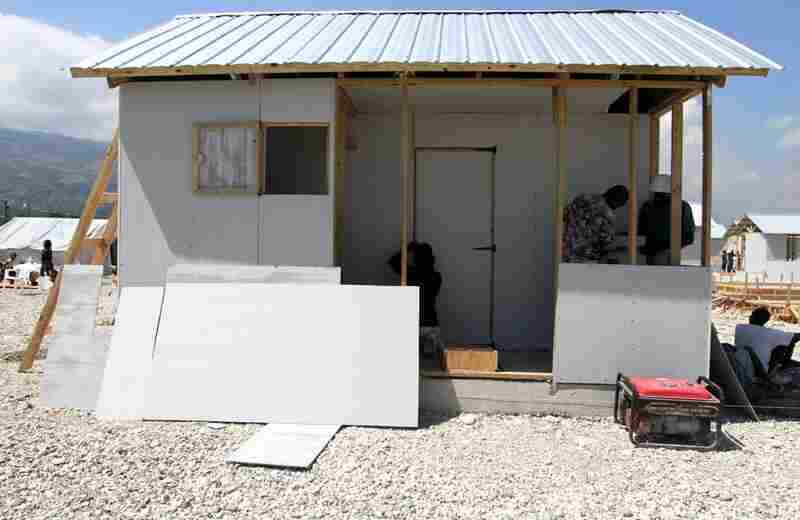 Aid agencies have built only 10 percent of 130,000 units of temporary housing that were promised. The Tabarre Issa camp, north of Port-au-Prince, is managed by the Irish charity Concern Worldwide. It is a beehive of cleanup and building activity, a remarkable sight when compared with other areas of town, where residents seem to have adjusted to life around the rubble. 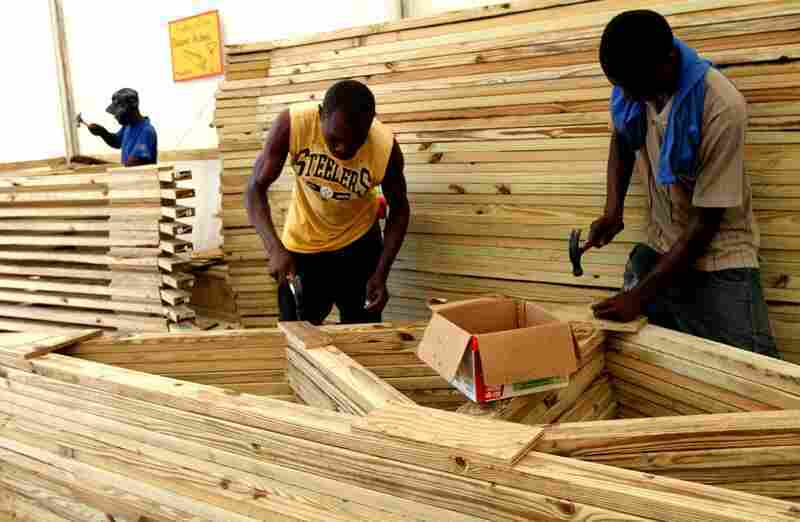 Unlike most current cash-for-work programs in Port-au-Prince, where locals are employed and paid by the hour, Concern Worldwide pays its carpenters according to output. The heavy downpours of Haiti's rainy season are among the biggest threats to the well-being of displaced residents living in camps. New transitional shelters are being built on foot-high slabs of concrete to protect them from rains and floods. A construction worker hired by Concern Worldwide takes a break. It's hoped that popular cash-for-work programs can help prop up the city's faltering economy. In Tabarre Issa, people must wait for their chance at a two-week-long contract, normally for cleaning-type work, which pays about $50. However, there are many more people living in the camp than there is work and, especially among women, unemployment and boredom are common and visible. Concern Worldwide's shelters are larger than some other designs. They come with a small front porch and a private composting toilet. However, they cost twice as much as some simpler models, and so far, few of them have been built. 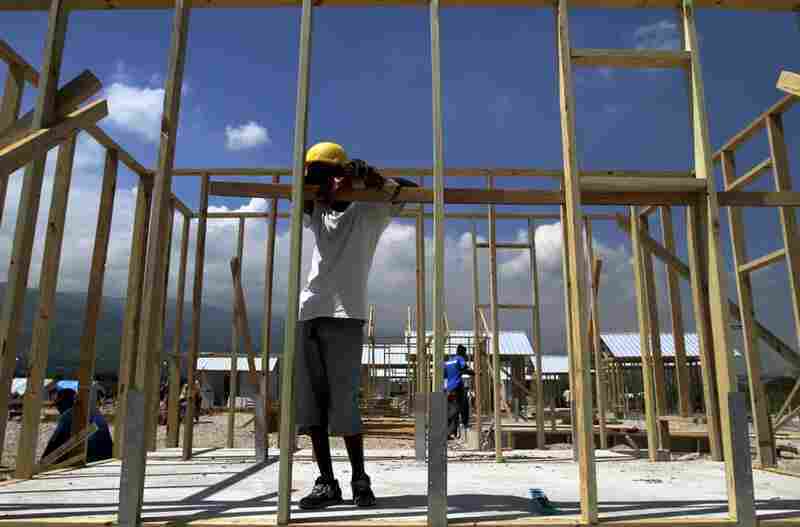 Haiti's recovery from the devastating January earthquake is moving slowly. One process that’s been going far more slowly than planned is the process of getting people out of tents and makeshift huts. The Jan. 12 quake killed more than 200,000 people and displaced 1.5 million others, according to estimates. Many of those left homeless gathered in makeshift tent cities or erected huts made of scrap wood and sheet plastic among the rubble. 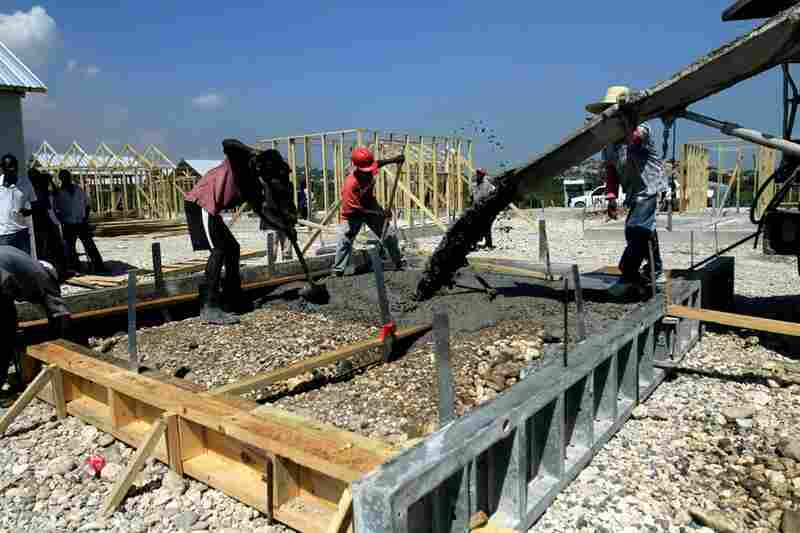 International aid agencies pledged to construct 130,000 units of temporary housing. 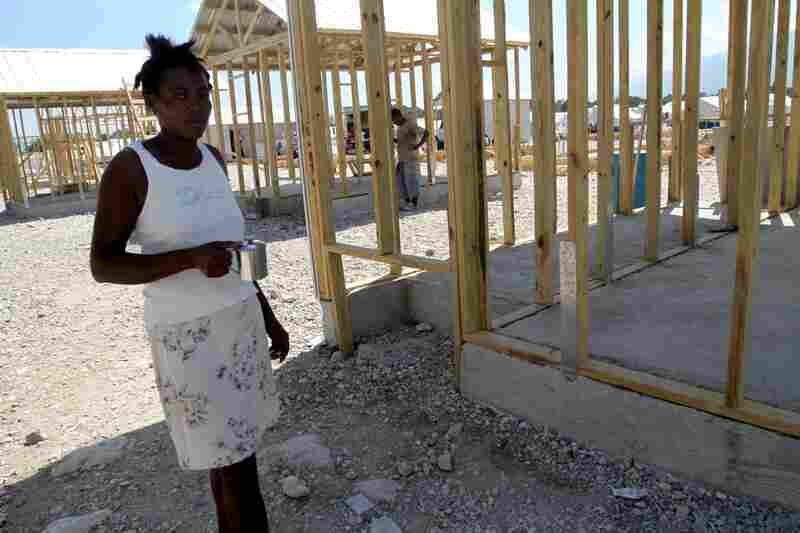 But so far, only 10 percent of the shelters have been built. Claudette Amilka, 49, sits in her tent in Tabarre Issa camp. She was moved there after her home collapsed in the Jan. 12 earthquake. Of Amilka’s five children, only her youngest daughter, age 10, lives with her in this tent. She has no work and worries about how she’s going to pay for her daughter’s education when schools reopen in October. Adding to the urgency of the situation, more than 1,000 camps across greater Port-au-Prince are still teeming with people. Many of the tents and tarps that were distributed up to eight months ago are disintegrating. In the Tabarre Issa camp just north of Port-au-Prince, more than 500 tents are laid out in long, straight rows in a gravel-covered field. The Haitian government set up the camp six months ago to move homeless earthquake victims out of a dangerous ravine in the capital. Even before the earthquake the ravine was prone to flooding and mudslides. Each triangular cloth tent is large enough to fit two single beds, although many people sleep on the gravel floors. The tents used to be white, but mildew and exposure to the elements have turned them a dull gray. Claudette Amilka, 49, says water comes into her family's tent whenever it rains. “The water is a problem here,” Amilka says. She says her roof leaks, and in heavy downpours the camp floods, pushing water over her cloth threshold. Amilka lives in one of the most organized, structured camps in Port-au-Prince. Hundreds of thousands of other earthquake victims ride out the rains in makeshift huts in the city’s chaotic encampments. Months ago, international donors passed out tents, tarps and plastic sheeting to just about every displaced family in Haiti. But now the tarps are fraying, the plastic sheets are patched with tape and the tents are wearing thin. Bob Fiddes, with the Irish aid group Concern Worldwide, is the manager of the Tabarre Issa camp. "These were not meant to be long-term tents. They were short-term relief tents," Fiddes says. He points out how the cloth on a tent in front of him is getting threadbare. Some sights in Port-au-Prince have changed in the eight months that have passed since the earthquake. 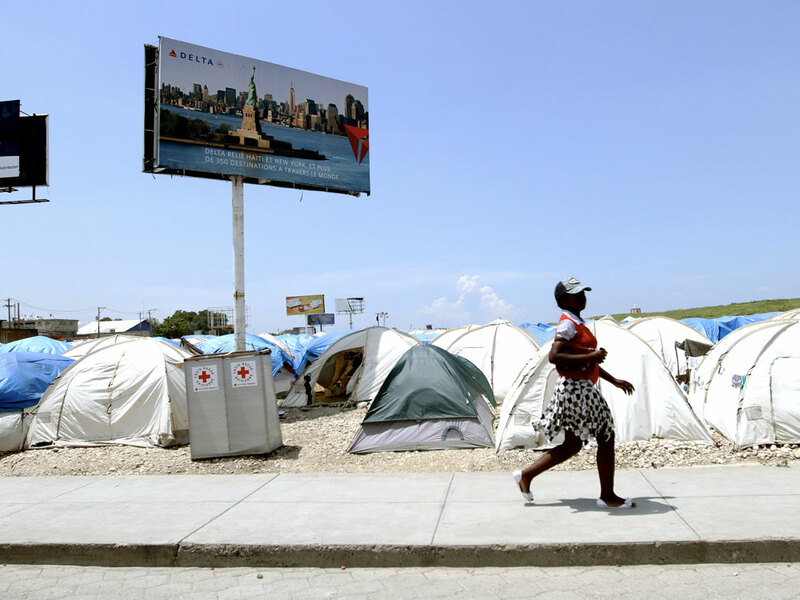 Billboards advertising mobile phones, home appliances and Delta Air Lines tower over a sprawling tent camp near Haiti’s international airport and stand in stark contrast to the meager lives of the camp’s dispossessed residents. "We've got our fingers crossed that this tent will last until the day [the tenant] moves into his house. But we are looking at this as a possible alternative. If we were to cover it with a tarp, it will at least keep it waterproof, keep the family dry," Fiddes says. Residents at this camp may get some sort of a house much sooner than people in many other camps across the city. This month, Concern started replacing the tents at Tabarre Issa with simple, wood-frame structures. Fiddes says they have finished 25 transitional shelters, but eventually they plan to build 1,200 there and in the surrounding community. On one edge of the camp, a cement truck is pouring a foundation for one of the houses. These bare-bones cabins do not have running water, kitchens or electricity, but they do have self-composting toilets. Fiddes says each house costs about $3,000. Technically, these structures are “transitional housing” and are only supposed to last two to three years. "I think if you and I come back here in 10 years, I hate to say it, people will still be living in these houses," he says. The houses are solid, but Fiddes makes the prediction because of the incredibly slow pace of the recovery. More than eight months after the earthquake pounded the Haitian capital, much of Port-au-Prince is still covered in rubble. The streets have been cleared. Some buildings have been demolished, but most have not. It is unclear how many survivors have moved out of the city or back into buildings that were damaged in January. Adam Fysh is the Port-au-Prince coordinator for the Shelter Cluster, a clearinghouse for more than 70 relief agencies that build or distribute shelters. Fysh says construction is being held back right now by questions over land ownership. Haiti had very poor land title records before the quake, and the disaster destroyed many of the documents that did exist. "I know the rubble removal is very slow. I know it’s going to take an extremely long time to remove all the rubble. But we are at a pace right now of transitional shelter construction that is more hampered by ownership," he says. Fysh says most aid agencies won’t put a transitional shelter on a plot of land if it is unclear who actually owns the property. "The agencies that are trying to work on land ownership ... have already found the low-hanging fruit. They’ve already found the people with clean land ownership documents. They’ve already built shelter in the free and available public land," Fysh says. He predicts that in the coming months, it’s going to be increasingly difficult to find places to put transitional shelters. And thus the hundreds of thousands of people still in tents and camps will probably stay there even longer.